Most of the attendees for the Christian Dior Fall 2012 presentation of course wore Dior – even high-street loving Olivia Palermo. The one person, aside from Donatella Versace and Anna Wintour, who didn’t wear Dior was Caroline Sieber. She opted to wear a Christopher Kane pink sheer, print and pleated pelmet dress from the Resort 2013 collection, which she styled with black strappy sandals. You will be delighted to know that you can pre-order this gorgeous dress from ModaOperandi right now. The trunkshow for Christopher Kane, which started today, ends on July 10 so you have just 5 days to select your favourite pieces. You have a wide selection ranging from floral-print tracksuits and black cracked leather jackets to ladylike lace, pleated and floral dresses to choose from. The fashion-savvy Caroline picked the best piece, but my second favourite look is the printed princess dress. Will a real princess select this look? She does favour British designers after all. 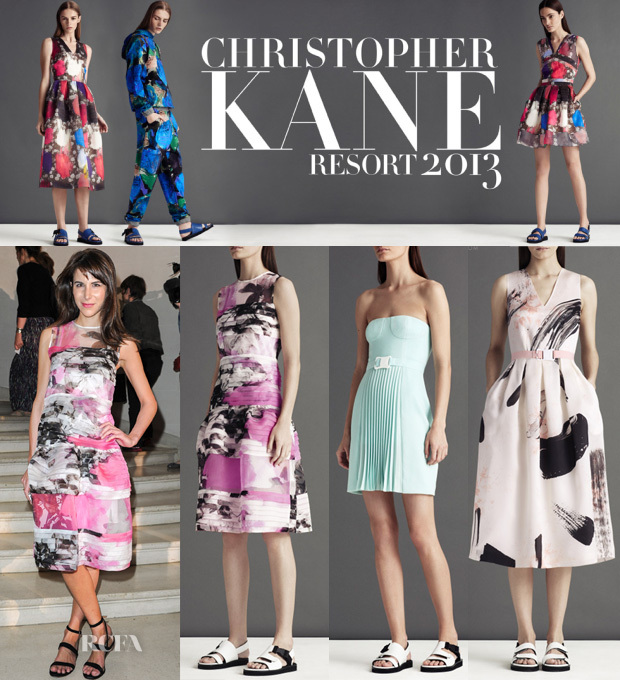 Pre-order Christopher Kane’s Resort 2013 collection from ModaOperandi.com now.